Timotius was born in Ungaran, a little town in Central Java - Indonesia, and raised in a family that prioritized education. 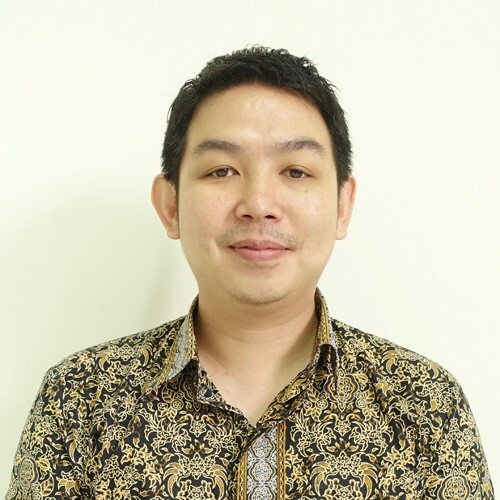 He achieved his bachelor degree in computer science and master degree in software engineering, he got his calling in education and has been working as a lecturer since 2005. Having extensive experiences as a network administrator, he has interests in computer networks and IT security. His motto is "Just do Your Best and Let God do The Rest". ABSTRACT: In spite of many efforts that already been conducted for improving wireless network, site survey method still hold an important role to ensure that optimization effort is succeed. This paper describes a result of wireless optimization in an overlapping wireless network environment, involving twelve classrooms. Several measurements using site survey technique have been done to define the most optimal configuration for twelve access points that provide wireless coverage for each classroom. There are three access point’s components that are involved in the optimization effort, they are: the direction of the antennas, the combination of channels and the level of transmit power. The optimization result has improved the quality of wireless network in the given environment. ABSTRACT: Load balancing is a technique to distribute traffic load into two or more lanes to reach balanced connection, optimized traffic performance, maximized data throughput, minimized delay, and avoiding data overload. Load balancing in a computer network used to modulate the balance of bandwidth usage between multiple internet service provider. This research contains Load Balancing performance test on HTTP, FTP, and VoIP. Testing application used is OPNET Modeler 14.5 simulator, and load balancing algorithm which being tested is Least Connection, Round Robin, and Ratio. The test results shows generally Ratio is better than Least Connection and Round Robin. Ratio excels on handling End-to-End Delay and Jitter in VoIP, while Least Conncetion shows the highest throughput value in all test cases. ABSTRACT: Virtual Private Network (VPN) has been widely used by Internet Service Provider in their backbone network, while IP Multimedia Subsystem (IMS) is an implementation of Next Generation Network concept. This research is a result of VPN performance testing on IMS network, where IPsec, L2TP, and GRE VPN Protocol are tested. Performance testing is done using OPNET Modeler Simulator 14.5 as simulation tool. Measurement method is done by sending HTTP, VoIP, and RTP data traffic in OPNET Modeler environment. Certain topology is created using OPNET Modeler to simulate and collect metric values, such as delay, jitter, and throughput. Collected values are analyzed and compared each other to reveal performance differences. Throughput measurement showed that IPSec is fit for HTTP and VoIP, while RTP needs L2TP to maximize performance. Average delay of L2TP is much lower than IPsec and GRE VPN, L2TP VPN also has the most excellent ability to handle delay on HTTP. Overall measurement results conclude that IPsec is better than the L2TP and VPN in IMS environment. ABSTRACT: Having a fast internet connection is the desire of every internet user. However, slow internet connection problems can be occurred in a particular company or organization that uses a proxy server. This report is about a research on optimizing the performance of the proxy server. Proxy server must have a good method of doing object replacement in its cache (Cache Replacement Algorithm), selecting the right method will increase performance. Changing method may give positive or negative effect on speed of internet access. This research reports performance measurement of several proxy servers that are applied on one of the internet providers in Bandung. The main parameters of measurement is Hit Ratio, Byte Hit Ratio, Response Time, and Size Distribution. The research conclusion is each Cache Replacement Algorithm has its own character dan ability in responding to the needs of each clients. ABSTRACT: One way shared-network optimization is to implement Quality of Service (QoS). Queue management is one of the important factors that existed at the QoS mechanism. In this research, tests of several queue management techniques done on a specific MPLS environment in the simulation environment. Software used to simulate the queue management at the MPLS is Network Simulator 2 (NS2). Various proposed recommendations for the selection of management techniques on particular traffic queues and environment, is expected to be a meaningful contribution of this research. With the existence of appropriate recommendations, implementation of queue management techniques in MPLS networks on a real case will be the maximum.